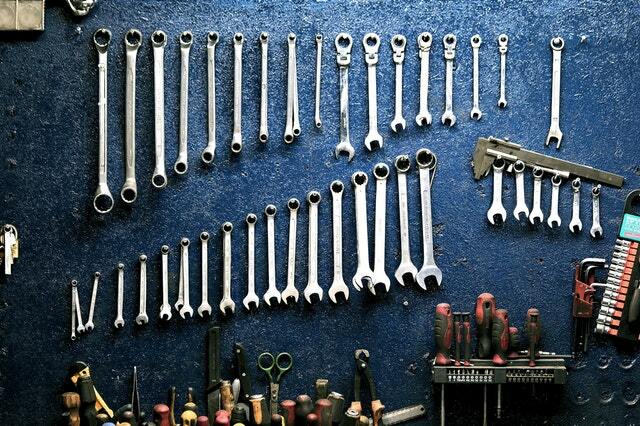 The garage or workshop can be one of the most cluttered areas of the home. Many products are available to help sort and organize the different items in the garage, but all you really need are some basic items that can be found around the house or purchased at a local discount store and your own creativity. Here are ten quick tips to get your garage organized without spending a fortune. Use a large garbage can to store bulky sports equipment such as balls, baseball bats, and hockey sticks. Small plastic food containers can be used to hold small pieces of your current project. If you don’t complete the project immediately, just label the cover with masking tape and permanent marker. All the pieces will stay together and the container will be easy to identify. Install large hooks for items such as hoses, extension cords and folding chairs. Coat hooks work great for this. Plastic office organizers work great in the garage. They can be used for sand paper, tools, and other small items. Printer paper boxes are sturdy and stack well. Check with local offices, they may just give some to you. If your garage is unfinished, use the space between the studs for shelves. Just cut a 2×4 to size and nail in place. This works great for small containers and spray paint cans. Baby food jars work great for very small item such as nails and screws. Just screw the lid to the bottom of a shelf, fill the jar, and twist into the lid. Use canisters or jars on the workbench to hold frequently used tools. Staple twine or heavy string to a board at about one-inch intervals leaving a little slack between staples. The loops created by the slack work great for storing screwdrivers. Secure the board to a convenient location. Label Everything! You don’t need fancy labels, masking tape and a permanent marker work just fine. An excellent place to look for garage organizing ideas is in the kitchen. Items such as silverware trays, dish strainers, spice racks, plus a whole lot more have many potential uses in the garage.